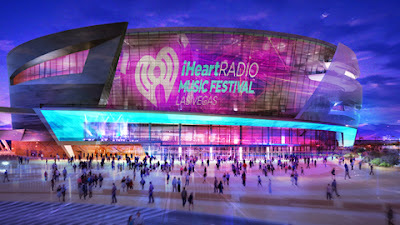 One of the more exciting development projects in Las Vegas is the new MGM-AEG Arena. The $350 million 20 thousand seat arena will be located directly west of (behind) New York New York. The joint partnership between MGM Resorts International and AEG Live is expected to attract top concerts, and possibly a pro sports team (although that's a long-shot). 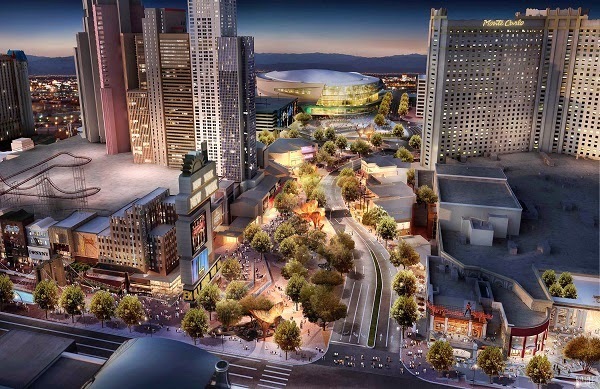 Part of the arena development will be The Park, which will be a retail walkway between Monte Carlo and NYNY. The outdoor space is a similar concept to The Linq. We can expect lots of restaurants and bars on the way back to the arena. There will also be changes to the front of NYNY which will add more retail space. I'm looking forward to the new arena (expected to open in 2016) and The Park, although I'm wondering if Las Vegas really needs more retail space. There seems to be a mall on every corner these days. It will also be interesting to see how visitors handle the hot weather in some of these outdoor spaces.